I personally don't think pitchers should be able to win the AL or NL MVP Award because they have their own award, the Cy Young. It's not like hitters can win that. But there's little doubt that right now the Most Valuable Player in all of baseball is Dodgers ace left-hander Clayton Kershaw, a former MVP and three-time Cy Young winner. On Sunday night, Kershaw finished a May for the ages (even though he got a no-decision because his bullpen blew a lead vs. the Mets), going 5-0 with a 0.91 ERA, 65 strikeouts, two walks and just 24 hits allowed in 49.2 innings. That's absurd. He became the fourth pitcher in big-league history to have an ERA below 1.00 and at least 65 strikeouts in a calendar month. The other three guys were pretty good: Randy Johnson (June 1997), Roger Clemens (August 1998) and Pedro Martinez (September 1999). Overall on the season, Kershaw has 105 strikeouts to just five walks. Amazing. It's the fewest walks ever allowed by a pitcher in the modern era when reaching a 100th strikeout. A 3:40 p.m. ET matinee in the Pacific Northwest. 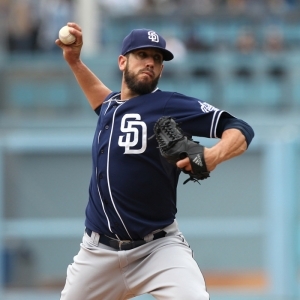 Might this be the final start in a Padres uniform for James Shields? You are starting to hear rumblings that he could be on the move because San Diego wants to deal him with his value at its highest point. Shields has 2-6 record but very good 3.06 ERA. He has pitched at least six innings in every start and has a 1.83 ERA over his past three. The White Sox have been scouting him of late. Seattle's Robinson Cano has a career .411 average off Shields with five homers and 16 RBIs in 90 at-bats. Kyle Seager is 5-for-15 with two homers and four RBIs against him. It's Hisashi Iwakuma (3-4, 4.33) for Seattle. He has thrown back-to-back quality starts and the Mariners have won both. San Diego's Alexei Ramirez is 2-for-14 off him with five strikeouts. Melvin Upton Jr. is 1-for-6 with a solo homer. Keep in mind that the Padres will add the DH for this interleague game. Key trends: The Padres are 0-11 in Shields' past 11 vs. teams with a winning record. The Mariners are 4-0 in Iwakuma's past four on Tuesday. The "over/under" has gone under in four straight Shields road starts. Great pitching matchup between two of the best young right-handers in the game. There aren't many pitchers I would choose over Miami's Jose Fernandez, but 25-year-old Pirate Gerrit Cole (5-3, 2.53) would be one, mainly because unlike Fernandez he hasn't had Tommy John surgery. Pittsburgh has won Cole's past four outings. He allowed no earned runs vs. the Diamondbacks over five innings last time out. Cole also went 2-for-3 with a double and a three-run homer. Cole has a 2.51 ERA in his career at Marlins Park. Fernandez (7-2, 2.82) has been spectacular of late, allowing a total of three earned runs over 27 innings in his past four starts with 43 strikeouts. Fernandez is 1-0 with a 2.77 ERA in two career outings vs. Pittsburgh. John Jaso is 2-for-4 against him. Starling Marte is 0-for-6 with four strikeouts. Key trends: The Pirates are 4-0 in Cole's past four on the road. The Marlins are 25-2 in Fernandez's past 27 at home. The under is 13-3 in Cole's past 16 vs. the NL East. The under is 4-1 in Fernandez's past five at home. Early lean: Marlins and under. Monitor the status of Mets third baseman David Wright here. He was expected to miss a third straight game with a neck issue on Monday. Wilmer Flores, just activated off the DL on Sunday, likely will start at third as long as Wright is out. New York also traded for James Loney from the Padres over the weekend, and he should start at first base against right-handed pitchers with Lucas Duda on the DL. And the Mets do face a righty in Mat Latos (6-1, 4.06). He has regressed quite a bit since a great start to the season. But he did beat the Indians last time out, allowing three runs and five hits over six innings. Latos will have to bat here with Chicago losing the DH. The Mets' Neil Walker is 7-for-25 with two homers and four RBIs off him. Yoenis Cespedes is 0-for-5. It's lefty Steven Matz (7-1, 2.36) for New York. He shut out Washington on four hits over eight innings last time out. He retired 15 straight at one point. Other than his season debut, Matz hasn't allowed more than two runs in a start this year. The only White Sox batter to have seen him is Todd Frazier, who is 1-for-6 with a homer. Key trends: The White Sox are 0-6 in their past six against lefties. The Mets are 4-0 in Matz's past four against teams with a winning record. The over is 4-1 in Latos' past five. The over is 4-1 in Matz's past five at home. Early lean: Mets and over. ESPN game and should have live betting at sportsbooks. The Cubs can set a major-league record in this one if they were to win for the 24th straight start of ace Jake Arrieta (9-0, 1.72). I predicted that streak would end last Wednesday in St. Louis and in fact Arrieta did have his worst start in about a year, allowing four runs and seven hits in five innings, but his offense bailed him out. That snapped a streak of 30 consecutive starts of three earned runs or fewer for Arrieta, the longest such streak in MLB history. Last time he faced the Dodgers, he no-hit them on Aug. 30, 2015. Adrian Gonzalez is 5-for-18 with a homer against him. Chase Utley is 0-for-10. L.A. goes with lefty Scott Kazmir (4-3, 4.84). He comes off one of his best starts of the year, allowing one run and four hits over six innings and striking out a season-high 12 against Cincinnati. Only a few Cubs have faced him. Dexter Fowler is 1-for-9. Ben Zobrist is 1-for-7 with three RBIs. Key trends: The Dodgers are 1-4 in Kazmir's past five vs. teams with a winning record. The Cubs are 23-5 in Arrieta's past 28 vs. teams with a winning record. The over is 9-1 in Arrieta's past 10. After losing third baseman Mike Moustakas to a season-ending torn ACL, the Royals were able to avoid another disaster on All-Star catcher Salvador Perez. He collided with third baseman Cheslor Cutbert, Moustakas' replacement, on Saturday. But an MRI revealed only a contusion and no structural damage -- Moustakas was hurt on the same type of play. Perez will miss 7-10 days. He's hitting .277 with seven homers and 25 RBIs. Kansas City starts Dillon Gee (1-2, 3.86) here. Gee was hit around by the Twins last time out, allowing six runs and 10 hits over four innings. Tampa counters with lefty Drew Smyly (2-6, 3.92). He also was roughed up last time out, tying a season high in allowing five runs over six innings in a loss to Miami. Kansas City's Jarrod Dyson is 3-for-7 off him with two RBIs. Eric Hosmer is 5-for-19 with a homer. Key trends: The Rays are 10-4 in Smyly's past 14 on four days of rest. The under is 5-1 in his past six road starts vs. teams with a winning record. Early lean: Rays and under.